Imagine that it's 1980. You're a young kid who is a huge Star Wars fan. 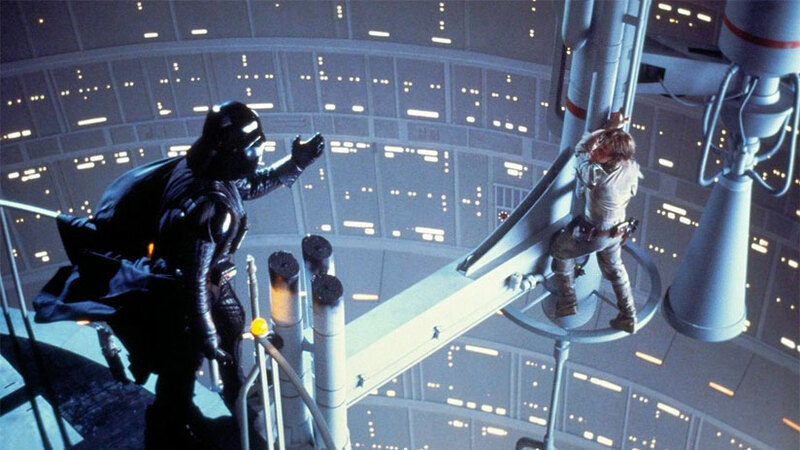 You've waited months to see the second movie, and when you finally do - you are blown away by the revelation that Darth Vader IS Luke Skywalker's father. Amazing! Your entire world has just changed! Now, imagine you're a young kid and it's the late 2000s. Your dad WAS that kid in 1980 and decides that it's time to show you all of the six existing Star Wars films, and for some reason he decides to show them to you in chronological order. By the end of the third one your hero Anakin has turned into to something called Darth Vader. In the fourth one you realize that there is a new Skywalker who actually was Anakin's son. Oh, so he's also Darth Vader's son. Then you watch Empire Strike back, and are like, "way to catch up Luke." Hi, my name is Mike. I am NOT the kid in 1980 or the terrible father that I mentioned in my premise - but imagine if I was!? No, I was only four years old in 1980 and was way too young to realize what the hell was going on in these movies. But 35 years later - I've matured a little and have learned to understand what in the hell was going on in these movies. A lot of people say that The Empire Strikes Back is the best Stars Wars movie - and I can't help but agree. At least it's the best one I've seen thus far....Cuz, I am going to be watching Return of the Jedi pretty soon - oh and that other one at some point (that point being opening night). I am 5/6 of the way through my Star Wars rewatch - and I took the approach of watching the movies in chronological order - but that's because I've seen all these movies, I know all these stories, and I'd rather get through the prequels first and get them over with - so I can end on a high note. And I am glad I took that approach, because if I didn't - I'd be watching Attack of the Clones tonight. But luckily I got to ENJOY myself and watch the 1980 classic known to the fans simply as "Empire." While watching it, I wondered what it must've been like for fans to watch this movie for the first time when it FIRST came out. They didn't know who Yoda was. They had no idea that Han was going to be frozen in carbonite, and they certainly did not know that Darth Vader was in fact Luke's father. Imagine discovering those things for the first time? As a geek, I'd find that amazing. As a little kid, I'm not sure how I found out - it was just so much a part of the lexicon that I just knew. I watched this movie on DVD, so I know there is some definite special edition stuff in here, but it wasn't as much as I thought. In fact it wasn't until they got to Cloud City that it was really noticeable. I also think that they overdubbed Boba Fett's voice with the actor who played his father in the original trilogy. I don't remember him talking like that - but I found it interesting that he was never referred to by his name. I know he was not in the original Star Wars (though he was stuck in the special edition for no real reason), and he was only referred to as "Bounty Hunter" in this one, so I didn't realize he wasn't even named until Return of the Jedi...where he is killed in like 5 minutes. Funny how beloved he is for how little he does. He's the Darth Maul of the original trilogy. I also liked the fact that they just tested out the carbonite freezing on Han, to see if someone can survive, because Vader really wants to use it on Luke. That I didn't remember and thought was a nice touch. Also, that Vader is already trying to overthrow the Emperor and wants to enlist Luke in his quest to rule the galaxy. But my absolute favorite part of this movie was a very small moment in Yoda's Hut. It's that moment when Luke realizes the little green man that he is with is actually the Jedi Master he is seeking, and we as an audience realize that it as well. I know it's a puppet, but there is this subtle change in the way he talks and looks that changes him from an old, crazy alien to the wise master that we know him to be. And there's a look on Yoda's face that, well it reminds me of Mr. Miyagi - there I said it. I am comparing a man and a puppet. But hey, both of them were thought of as jokes by their young students at first - so maybe I'm not totally crazy. But I am totally done this blog post, and totally looking forward to Return of the Jedi - and totally 100% excited for the Force Awakens. We already have our tickets for the 17th of December. We are less than a month away! And in the meantime, I get to watch me some Ewoks!